The Young Members’ Section of the CLLA was established in 1972, and is open to any League member in good standing who is 40 years of age or younger. Membership is also open to members who are older than 40, but who have only been a member of the League for three years or less. The goal of the Young Members’ Section is to acquaint newer members of the League with the objectives of the CLLA and promote active involvement from the very start. Besides contributing to educational programs at CLLA meetings, YMS provides leadership opportunities through its Executive Council and sponsors social events that help build a spirit of camaraderie. 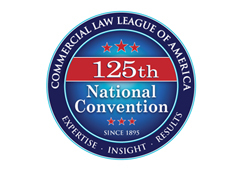 To facilitate a new member’s involvement in the CLLA, the section sponsors an orientation session for new members at each of the League’s national meetings. These VIP events allow new members to learn all about the CLLA, its membership potential and opportunities. Prior to the meeting, new members are enrolled in the mentor program. Each new member is assigned a “mentor” during his/her first meeting. The mentor serves as host for the new member introducing them to fellow members and enhancing their network opportunities. Each orientation session is followed by a VIP reception where new members are invited to network with the League’s board members and committee and section chairs allowing the new member to network with the most active members of the League as well as learn first hand about the benefits of CLLA membership. The section also sponsors educational seminars and social activities at CLLA meetings with section members serving as speakers and hosts. These events are designed to bring all members of the League together to network and build both business and personal relationships. Whether watching the hottest show on Broadway, taking a dinner cruise on Lake Michigan or enjoying the comedy of Second City, members of the League look forward to events presented by the Young Members’ Section.